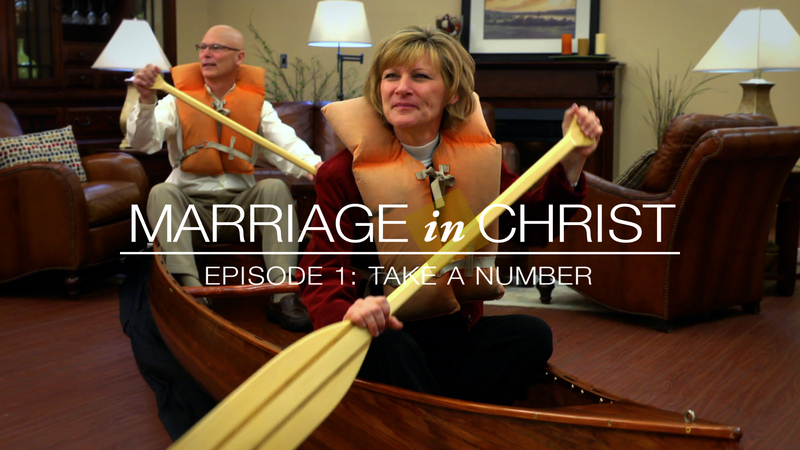 Bob and Christine Brickweg perform in a new video series that is part of the Marriage in Christ seminar. Story by Chris Meehan. Photo courtesy of Greenlawn Films. Marriage in Christ, an outreach sponsored by Servant Branch, conducted a training institute for couples from across the community from September 5 to 7. Sixteen couples from 10 community branches traveled to the Twin Cities to attend the three-day institute held at the River Ridge branch center. Its goal was to expand the Marriage in Christ (MIC) seminar nationwide by training the couples so they can put on seminars in their local areas. The seminars are aimed at the general public, but community couples can also benefit from attending, Joel says. They are ecumenical in their content and approach. The seminar consists of five weekly sessions of talks and discussions, usually hosted by local churches. Topics covered include strengthening the couple’s relationship with God and with each other, sin as an obstacle to a loving marriage, the Holy Spirit, and practical areas such as sexuality, forgiveness and family life. Couples perform homework between the sessions, taking 20 minutes each day to pray, to grow in friendship through conversation and to perform small acts of love and service for each other. Couples pay around $100 to attend the seminar which includes manuals they can use for follow-up. The institute in September also featured the debut of a new series of five videos produced by Greenlawn Films in South Bend. The videos rely on short dramas and personal stories to cover the basic teaching points of the seminar, and they will replace the talks in the future. Greenlawn Films spent a year developing the videos, writing scripts, holding auditions and rehearsals, then filming and editing. Servant Branch couples Bob and Christine Brickweg and Tom and Nancy Caneff are the presenters. South Bend branch members Joe Gleason and Elizabeth Grams directed the episodes, and Sean Connolly was the producer. At the institute, couples attended a condensed version of the seminar and learned the ins and outs of putting it on successfully. They received a kit with the materials needed to host seminars, including the videos and manuals. “It was exciting to see something concrete that we can offer to the wider world,” said Natalia Bendele (Shreveport), who also attended the institute. Bill Wacker, who directs the MIC outreach, says that the idea originated in 2010 after Servant Branch members heard prophetic words about outreach. Bill has had a longtime interest in the Bible’s teaching on marriage, and he and Joel began talking about starting a marriage outreach. Soon Bill’s wife Adella joined the discussion, along with Bob and Christine, Tom and Nancy, Sam and Mary Claassen, Chris and Peggy Dietzen, Dave and Peg Louiselle, George Wolney and Jan Sweere. “We did a lot of experimentation and had many conversations among ourselves and with the community’s board of governors before we came up with what we have now. Once we got going, we also got feedback from participants,” Bill says. Since 2011, Servant Branch members have put on more than 20 MIC seminars in area churches and at River Ridge. Three hundred couples have attended. The Roman Catholic Archdiocese of Saint Paul and Minneapolis has welcomed MIC to several of its parishes, and a diocese in Iowa is interested in spreading the seminar in their area. Over the course of the last nine months, the MIC team has been gearing up to spread the seminar more widely. They hired one:ten communications to redesign their web site and worked with Greenlawn Films to produce the video series. They overhauled their manual to make it easier for couples to use, and they hired Laura Brickweg in Servant Branch to work as an administrator. They have a seminar scheduled soon at St. John Neumann Church in Eagan, MN, and they are planning to hold another training institute from November 14 to 16. The creation of this whole program was a labor of love! What a huge amount of work and prayer. Thanks so much to everyone involved especially Elizabeth, Joe, Sean and the couples in the video. Praise God for our life together. PS Also a huge thanks to Bill, Adela and Joel who have cared for every detail of the MIC project from it's very beginning. So glad and so hopeful! This is definitely needed for married couples. God bless all who worked on Marriage in Christ and blessings on all whose life will be changed because of this program!